Hawick Knitwear's Liddesdale Road factory. It has been announced today that Hawick Knitwear is to go into administration resulting in the loss of 123 jobs and threatening a further 56 jobs. The well known company currently employs 179 members of staff. Administrators KPMG are currently looking at available options to complete orders in progress and whether an early sale of the business and its assets can be secured. Provost Stuart Marshall said: “This is the worst possible start that our town could have to the New Year. “I’m absolutely shattered to hear that this company is to cease trading and I cant begin to imagine what the employees are feeling at this moment in time. 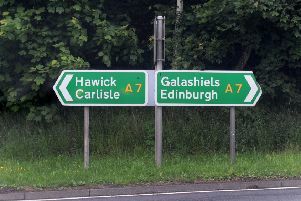 Calum Kerr, MP for Berwickshire, Roxburgh and Selkirk, said: “This news is shattering for Hawick and the Borders and I want to express my profound sympathies for all those who have been made redundant as a result. “I have been in touch with the Scottish Enterprise, which is seeking to have early meetings with the company to to see what help it can provide. “I’ll also be reaching out to the administrators to offer any support I can in working to secure a future for the company. “Hawick Knitwear is a hugely respected operation with a top class reputation within the industry and a brilliant, dedicated workforce. It has a long history in the town dating back to 1874 and is very much part of its industrial heritage. “I believe that real opportunities do exist for the business to succeed. “This is always a challenging time of year in the knitwear sector, but the company has a strong history in high-end products such as cashmere and this is very much where the market is heading, with consumers worldwide eager to buy these products. I am happy to play any role I can in securing the company’s future. John Lamont MSP has written to the administrators asking for an urgent meeting and has called on the Scottish Government and its agencies to do all it can to help those who have lost their jobs. Mr Lamont said: “This is devastating news for staff and a big blow to the whole of Hawick. “It is a massive shock to lose such a well-respected and big name as Hawick Knitwear. For over 120 jobs to go in the town, just like that, could be catastrophic, which is why the Scottish Government must do all it can to provide support to those who have lost their jobs. “I have also requested an urgent meeting with the administrators to seek clarification that everything is being done to protect those jobs that remain and find a buyer for Hawick Knitwear.